Expanded Split Level in River Vale! 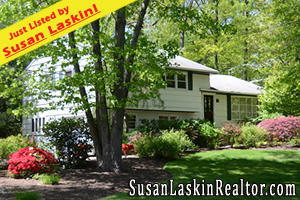 | Pascack Valley Real Estate - Expert Local Real Estate Information from Susan Laskin, Your Pascack Valley Realtor! Pascack Valley Real Estate – Expert Local Real Estate Information from Susan Laskin, Your Pascack Valley Realtor! Expert information for Pascack Valley & Bergen County NJ Real Estate! Expanded Split Level in River Vale! River Vale Real Estate! Pascack Valley Real Estate! 547 Green Lane in River Vale ($558,950!) is an outstanding & expanded Split level w/ updated Breakfast Room addition/skylight off the Kitchen & an expanded Formal Dining Room. Beautifully finished hardwood floors..Large and inviting Formal Living Room..Master Suite w/ beautiful & updated Master Bath w/ exquisite stone work & undermount sink. There are two additional spacious bedrooms and Full Bath. Spacious ground level Family Room w/ doors to patio. Updated Bath off Family Room. Ready to finish basement. Central A/C 4yrs. Newer furnace 4 years. Hot water heater 1 year. Magnificent neighborhood of beautiful homes. With a location that’s adjacent to a Country Club, top rated schools and an ez nyc commute by car, bus and rail, this home has tremendous value! Take a Virtual Tour of this home! Click here for more photos & information! Looking for more River Vale Real Estate? Browse through my Feature Homes! Some incredible listings across the wonderful Pascack Valley towns! This entry was posted on Friday, July 8th, 2011 at 7:22 pm and is filed under Bergen County Real Estate, Pascack Valley Real Estate, River Vale Real Estate, Uncategorized. You can follow any responses to this entry through the RSS 2.0 feed. Both comments and pings are currently closed. Just Sold! – Pascack Valley Real Estate! Your Pascack Valley Real Estate Newsletter! April 2014 Edition! Your Pascack Valley Real Newsletter! March 2014 Edition!